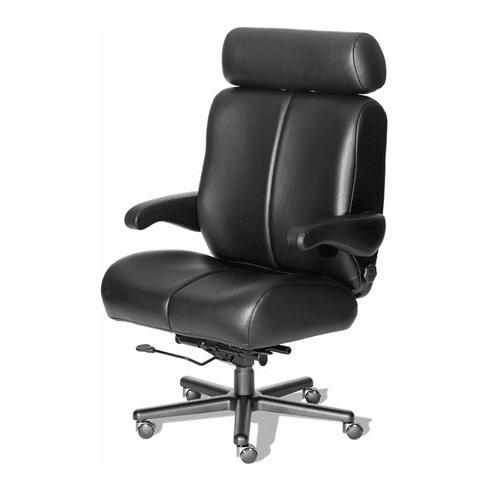 There is no other heavy duty big and tall executive chair like the Big Sur from ERA. When you’re seated in this elegant Big Sur chair from ERA, people are likely going to look at you and call you Big Sir! Even if you’re a woman… trust us, it’s an expression of respect! This is the ultimate chair for large people, with a 26-inch wide seat, thick padding, full 4-way lumbar support, and flip-up arms for easy entry and exit. It offers all the adjustability features you’d expect in a premium office chair, and it’s fully rated for up to 500 pounds. The steel frame is warrantied for life, so you can enjoy peace of mind along with outstanding comfort. You can have it upholstered in fabric, vinyl, vinyl/leather or full leather. This is your chair, Big Sir! (or Ma’am…). Features include an all steel lifetime warranted frame and floating spring seat suspension, a generous 26" premium foam seat cushion, thick foam molded backrest cushion, full length 4-way adjustable headrest that supports the head neck and shoulders, 2-Way adjustable lumbar support that adjusts up/down and in/out, seat slider for seat depth adjustment, rocker reclining heavy duty mechanism, tilt tension adjustment, pneumatic seat height adjustment, 360-degree swivel, flip-up arms for easy entry/exit standard, optional height/width adjustable task arms available, heavy-duty aluminum base in chrome or black finish, optional all steel 30 inch base available, heavy duty all steel frame nylon casters standard. Optional soft wheel casters available at no additional charge. Pneumatic cylinder options available at no additional charge. 3.5" cylinder designed for those who are over 6'2" tall. ERA chairs are designed by a leading auto interior manufacturer and are individually crafted upon ordering. Every ERA chair is handmade in the USA. The Big Sur office chair meets or exceeds ANSI/BIFMA standards.